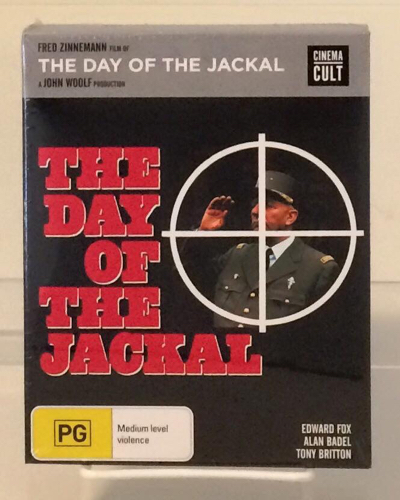 4xblu received one title in the mail today, the customer requested debut of Fred Zinnemann’s “The Day of the Jackal” from Australia. One of the great political thrillers of the 1970s, the film stars Edward Fox as the titular Jackal, a world class assassin who’s been contracted to kill French president Charles de Gaulle. The film is a taut, documentary-like procedural that follows the Jackal as he travels around Europe, meticulously seeing to every detail as he makes the necessary preparations to carry out the job. “The Day of the Jackal” is based on a novel of the same name by Frederick Forsyth, whose works have also provided the basis for films such as Ronald Neame’s “The Odessa File” and John Mackenzie’s “The Fourth Protocol.” Though there are historical elements that are woven into the narrative, the plot to kill de Gaulle at the center of the narrative is fictional.